Why is The U.S. Budget is unsustainable? 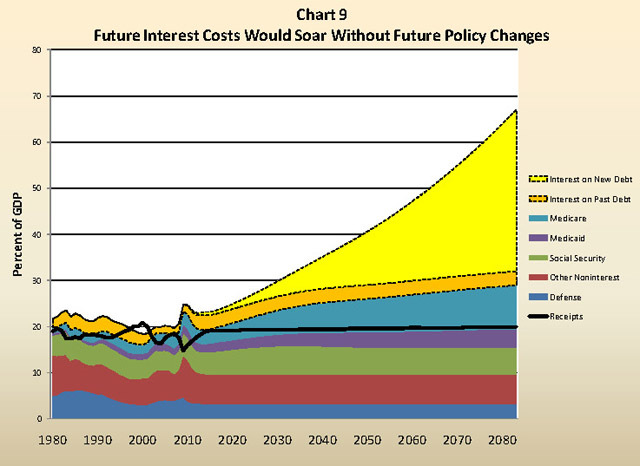 Spending on entitlement programs and interest on the national debt are now accelerating at exponential rates. Some time around 2020 they will eat up every single dollar of federal revenue that is brought in before a penny is spent on anything else. Of course the solution to all of this would be to radically cut entitlement programs, but no U.S. politician in his or her right mind would do that... By 2080, they are projected to eat up approximately 50 percent of GDP. And according to the Congressional Budget Office, in 2010 the Social Security system will pay out more in benefits than it receives in payroll taxes. That was not supposed to happen until at least 2016. Over 100 million Americans now receive direct payments from the United States government. Now, the truth is that helping the poor and those who cannot help themselves is always a good thing. But are there really 100 million Americans that cannot take care of themselves? Of course not.